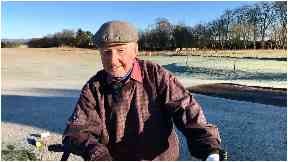 Les Skelton was encouraged to take up golf after being injured in the Second World War. Reported by Ben Philip and Peter Cassidy. A Second World War veteran who had his shoulder "blown off" during the conflict 75 years ago is still going strong in his 90s as an inspirational golfer. 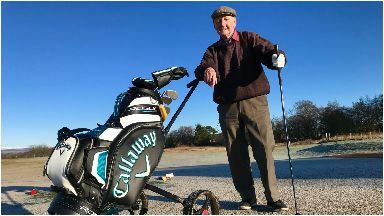 Les Skelton was encouraged to take up golf after being injured while working as a tank operator during the war in 1944 and hasn't looked back since. The 95-year-old from Brechin is still an honorary member of the town's golf club and has no intention of putting the clubs away any time soon. He said: "It's just you against the golf course and I just love it. It's such a friendly club and it's stayed that way all the time. It's great." Recent research found that people who play golf can live up to five years longer than non-golfers, with the long walk and social aspect being credited with bringing a number of physical and mental health benefits. And for Les who celebrated his 95th Birthday last week, he believes it’s the best prescription. He said: "I've done alright, It's very good for you. "It's bound to be with all the fresh air, the exercise and friendliness - laughter is the best medicine you know?" Despite formally holding a handicap of 7, he never won the top prize in the 50 consecutive Brechin Opens he competed in. But the popular member, who recently had a trophy named after him, says he has no plans to give up the sport any time soon and will play for as long as he able to. Laughing he said: "Yes. I'll maybe die on the golf course."